Yesterday I was so happy to see good old Karen bustling around and getting ready for cocktail party at her home. She used to throw lil’ get-togethers around her pool almost every weekend in the summer, but since we had our tiff, she has seemed down and less social (and fatter). Anyway, it is important to keep yourself busy, and I was glad to see Karen getting ready for a few friends yesterday. Unfortunately, late afternoon, when she ran out for a few minutes, her whole pool seemed to back up somehow and it was a real mess. It was filled with leaves and dirt and who knows what else, and the pump was broken. Poor Karen! She had to have her party indoors because her normally beautiful garden was a real eyesore. I don’t want to have to call anyone, but if she doesn’t get taken care of soon, then I might have to let the zoning people and the bug people know that she has this unsightly, unmaintained mosquito breeding ground in her backyard. It would be a shame if she had to get rid of her pool. She loves that pool almost as much as her husband and dog. Ooops! It seems like she just doesn’t care anymore. A mutual friend told me at the grocery store this morning that there was a part missing from her pool that is also out of stock at every pool store for miles around and it will be a few weeks before they can get order it and install it. It is a tiny little part, just a few pennies, but it has to be ordered from Asia, so her pool may be out of service for the rest of the summer. Poor Karen. What did she ever do to deserve such terrible luck? This entry was posted in Our Neighborhood and tagged crying, mess, mosquitos, party, pool on July 12, 2015 by mythreeangles. Karen didn’t invite you to her party and the Universe breaks her pool. Isn’t karma amazing? Karma is my best friend sometimes. It’s quite telling that Karen doesn’t get more help from her boys isn’t it? It’s clear that your children would never abandon you, even in the most dire consequences as you are such a devoted mother. Again- karma. Yes. Her boys are really lovely young men, but who wants to spend time with a weepy old lady? I like to think of them hanging out on the beach in front of Mitch’s beautiful condo, while Karen attempts to plunge whatever mess backs up from her pool into her bathtub and cries. I think the pool looks perfect for a distressed photo shoot. Oh Jojo, that sounds lovely. Have you considered candied apples and boater hats? Maybe you could find a state fair and have them wrinkle their noses at fried food in an adorable manner. You have what sounds like an irresistible instagram! Let me know if you want to stop by the pool o’ effluvia and snap a few candids. I did the apples, boater hats, and fair with my smalls in 2012 It’s so overdone, but I’m sure your kids would like something like that. We can chat later, homeschool takes no summer vacation and I only allot myself 5 minutes of me time, every 24 hours. Time’s up! My goodness what a rathole! Your homeowner’s association lets people have open sewers like that in their backyards? UGH! That looks like snapping turtle heaven, better call Turtleman! No, my homeowners association does not allow people to have that kind of mess in their yard, but they also do not answer their phones on the weekends, Cindy. I hope Cindy enjoyed her weekend. I’m sure her precious time off is worth exposing the entire neighborhood to West Nile Virus. I don’t know how you put up with these people, Lah Lee. You’re a saint. 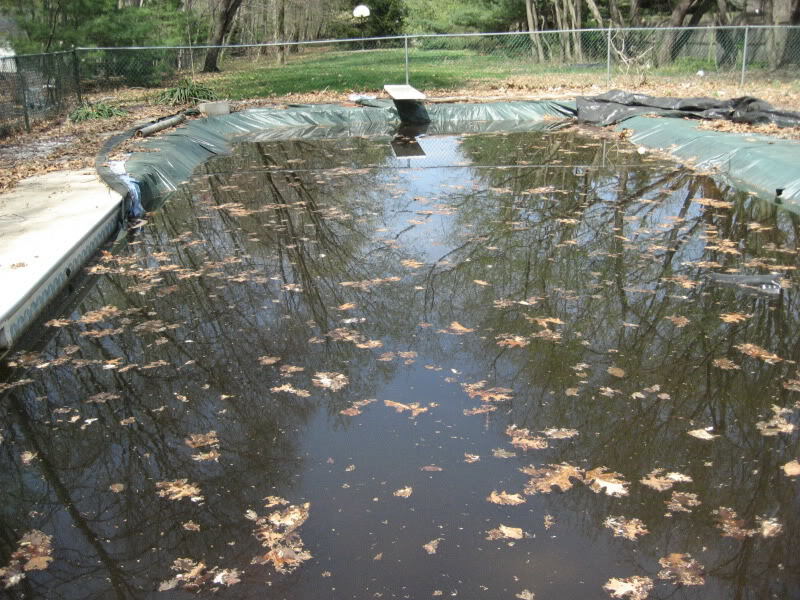 It’s a good thing you don’t have a pool yet, you can honestly say you don’t understand what went wrong with Karen’s pool, no one can accuse you of interfering with it! I am not sure what you mean? Why would anyone think that I would break Karen’s pool? I am a busy mom, and not even friends with her. It is neither here nor there to me what happens to that pool. Of COURSE you would never break Karen’s pool, but there are nasty malicious folk out there who love to damage the reputation of the best people. Naturally they are just jealous.